Acquired: TTM 2011, C/o Home. After transferring from JC to Iowa in 1989, Michael Titley would provide stability at the tight end position for the Hawkeyes with his size (6’3″, 235) and hands (tied for team lead with 29 receptions) in 1990, replacing Marv Cook at the position. He’d post at least a reception in each game his senior season. Don Shula‘s Miami Dolphins would pull the trigger on Titley drafting him in the 10th round of that year’s NFL draft. 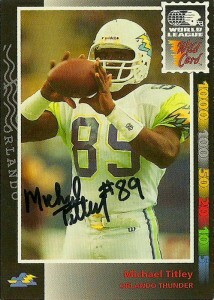 In 1992, Michael would sign with the WLAF’s Orlando Thunder. As a speedy, pass catching tight end, Titley would fit in well with the Thunder’s hybrid spread offense, under Galen Hall’s direction. He’d post a respectable 22 receptions for 215 yards catching passes from quarterback Scott Mitchell. After the Thunder lost to the Surge in World Bowl II, Michael would have to put his football playing days on hold with the reorganization of the WLAF. In the meantime, he’d return to Iowa and complete out his degree. With the reemergence of the WLAF as NFLE in 1995, Titley would return to play in the league, this time as a member of the London Monarchs. He’d post his best season as a pro, making 45 receptions for 457 yards and 3 touchdowns. Michael would play for the Monarchs an additional two seasons hauling in almost 30 receptions and just over 300 yards in both seasons. He’d retire after the 1997 season, but not before having experienced professional experience on the rosters of the Eagles, Colts, Vikings, Bills, and Broncos over his career. He currently lives in Houston, Texas where I tracked him down via Spokeo. For some reason I was able to get a bunch of addresses via the paid social crawl tracking service for free and Michael was on my list. He responded in a brief 13 days and thanked me for writing him and told me that he’d be more than happy to keep in touch. At some point, I’ll probably write him at a later date to get feedback on his WLAF/NFLE experience. Below are his WLAF/NFLE statistics.